Remember that game we used to play as children? 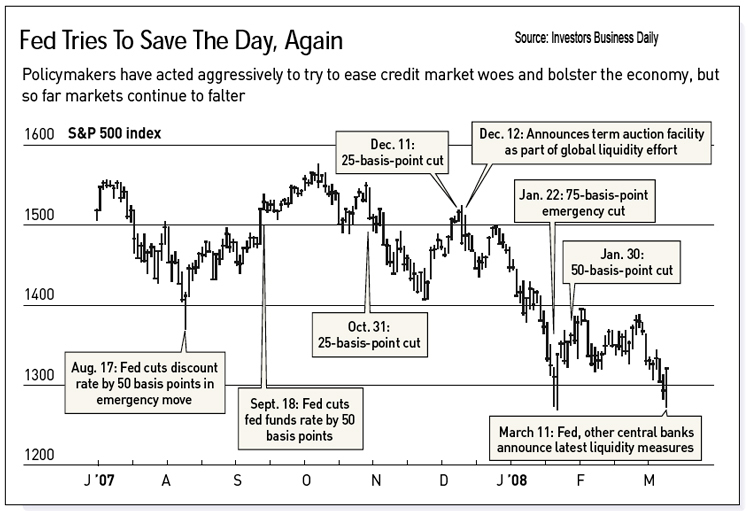 Now the Fed is playing: Cut, Cut, Cut, Cut, GOOSE, Cut, Cut – GOOSE! 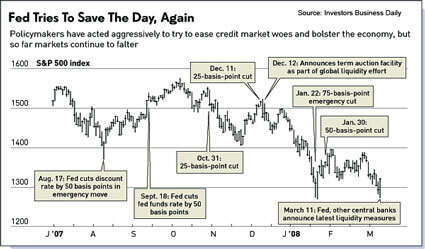 Below is a great chart from Investor’s Business Daily that illustrates how the recent actions, policies and interventions have helped(?) the equity markets. While the Fed’s primary goal has been to restore liquidity to the credit markets, the collateral damage from the sub-prime and housing malignancy has negatively effected the dollar and equity markets. Nothing new here. So far, as far as the market is concerned, the Fed Plan(s) have come up as Big Fat Goose Eggs ! A recent estimate based on subprime mortgages foreclosed in the fourth quarter of 2007 indicated that total losses exceeded 50 percent of the principal balance, with legal, sales, and maintenance expenses alone amounting to more than 10 percent of principal. 50%? 50%? So, they are showing a 40% reduction in value for the subprime debt and another 10% for the miscellaneous administration. With the time period between the last mortgage payment and REO liquidation lengthening in recent months, this loss rate will likely grow even larger. Moreover, as the time to liquidation increases, the uncertainty about the losses increases as well. The low prices offered for subprime-related securities in secondary markets support the impression that the potential for recovery through foreclosure is limited. The loss rate will likely grow larger? The loss rate will likely grow larger? How much larger? 55%? 70%? If that is not enough, he states that, “the potential for recovery through foreclosure is limited,” which will effectively create a widespread outbreak of insomnia for everyone homeowner as they watch their property value free-fall due to get-it-sold-at-any-price by lenders that do not have the financial ability to carry their newly inherited/foreclosed properties. The magnitude of, and uncertainty about, expected losses in a foreclosure suggest considerable scope for negotiating a mutually beneficial outcome if the borrower wants to stay in the home. Hmmm….Now that Spitzer is out of the way, and Fannie (FNM) and Freddie (FRE) are bleeding out…. One small step backwards for private-lending…One giant leap ahead for socialized-housing.